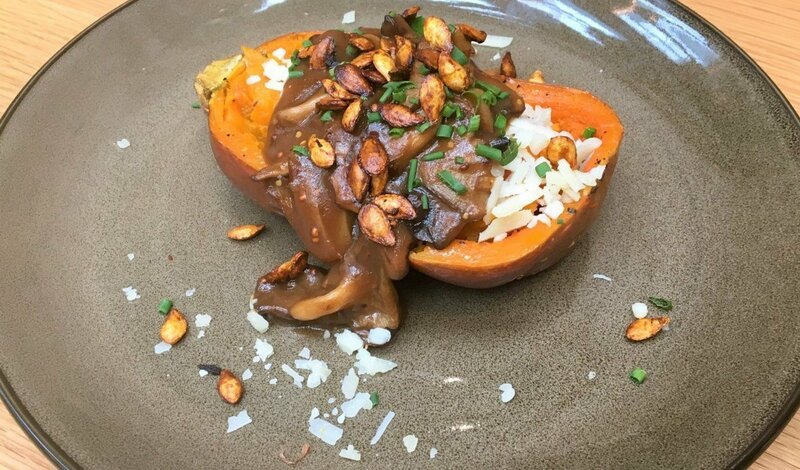 Sweet honeynut squash and savory wild mushroom gravy are a perfect combination for this autumn dish. Topped with its roasted seeds, this is a great way to utilize the whole vegetable for root to stem cooking. Cut the honeynut squashes in half, lengthwise. Season with olive oil, salt and pepper. Roast, cut side down, in a 400F oven until the squash skins are golden brown and squash is fork tender, about 25 minutes. Toss the squash seeds with olive oil, salt and pepper. Roast on a parchment lined sheet pan for about 8-10 minutes until golden brown. Set aside. Meanwhile, sauté the wild mushrooms, large shallot and garlic clovesin butter over high heat. Add to the prepared Knorr Brown Gravy. Stir in the Maille Old Style mustard and season to taste. Using a fork, mash the inside of each squash. Add ¼ cup farro to each squash half, then season to taste. Top each with Gruyere cheese, then return to the oven until the cheese is melted. To serve, top each squash half with ½ cup of the wild mushroom gravy. Garnish with chives and roasted squash seeds.